On this edition of Inches, Vero, Mike and Tone, cover a lot of ground. From first impressions of the recently debuted Alliance of American Football (AAF) league, to the declaration of 4th & Inches basically being an Orlando Apollos cast from now until the draft, we kicked things off on a more business-like note than usual. There was of course some Brian Flores and Dolphins talk as well, in addition to the regular inappropriate discussions! - Perhaps the biggest thing to take away from this ... See More episode was the announcement of our new LIVE show exclusively on our YouTube channel! If you're seeing this anywhere but there, get over to youtube.com/c/4thinches and subscribe with alerts now, so you can be a part of our first ever LIVE Inches event, complete with a live chat so we can interact with the listeners in real time. Sunday, February 17th at 3PM Eastern. Don't miss out! 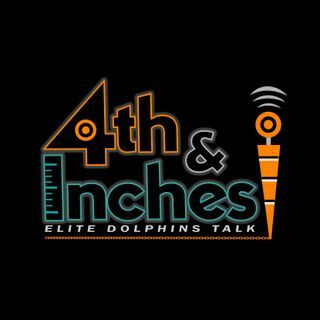 - Find us on Dolphins Twitter if you want half of the stuff we talk about to make actual sense! --->http://twitter.com/4thAndInchesNFL.